. Published on July 27, 2018 . 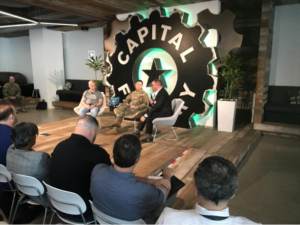 Lt. General Eric Wesley (ctr) at the Capital Factory in Austin, discussing the new U.S. Army Futures Command that will be based in the area. Stout Magazine recognizes the bold vision of Lt. General Eric Wesley, who is tasked with taking the Army into the Future(s). When you’re looking for the latest in technological advances and forward-thinking, you look to start-ups. And the United States Army is preparing to launch the mother of all start-ups, the U.S. Army Futures Command (AFC), in entrepreneur-heavy Austin, Texas. 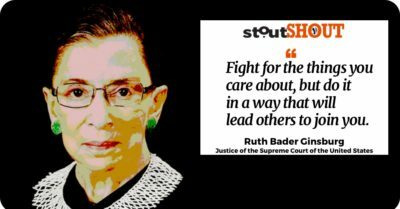 Stout Magazine salutes the bold, brave and determined thinking that’s driving this revolutionary pivot. Now imagine the stakes when the competition is Russia or China, and the product is national protection. The U.S. Army has imagined it, and is upping their game, by reorganizing and relocating their core research and development functions in a place where “innovation, networking and collaboration are happening daily”. While awaiting Senate confirmation of the inaugural AFC commander, the leader of the Army’s Capabilities Integration Center (ARCIC), Lt. General Eric Wesley, has been charged with guiding development of the project, which envisions Army soldiers and civilians teaming up with entrepreneurs, scientists and researchers in incubator hubs to improve the speed, breadth and depth of military technological innovation. The new AFC, the Army’s most significant reorganization since 1973, will focus specifically on projects that target six key priorities of modernization: improving long-range precision fires, developing a next-gen combat vehicle, creating future vertical lift platforms, implementing a mobile/expeditionary Army network, bolstering air and missile defense capabilities, and increasing solider lethality. Teams are already heading to Austin to establish initial operations, and the Army expects to be at full operating capacity – a 500-personnel command, btw – within a year. Now THAT is #Stout. Looking to #BringOutYourStout and make a big, bold move? Incorporate these bold, brave and determined strategies from Lt. General Wesley and his corps of innovators and make your own revolutionary pivot. Be a radical even in a traditional culture. According to Wesley, “the Army has traditionally had long development cycles, which will no longer work” as other countries’ militaries ramp up their own innovations. It’s easy to keep going along with “the way we do things”, especially in organizations that typically value and reward conformity. But innovation requires someone not only with vision, but the willingness to sit in the hot seat of change to shake things up. Be willing to venture outside – way outside – your comfort zone if you want to change things. Undersecretary RyanMcCarthy believes that the type of ecosystem that allows development on an entrepreneurial scale “cannot be duplicated from behind the walls of traditional posts and forts.” The Army has traditionally kept its projects very close, behind the walls and gates of military installations. They have also never actively sought entrepreneurial partnerships on this scale. But as Lt. General Wesley explained in Austin, “We want all the best ideas, and those reside in places like this.” A big shakeup requires a big stretch. Being uncomfortable is a must for growth. Once you make a decision, be all in. This is not a test run or pilot program. In his presentation, Wesley stated that the new Futures Command Center will employ around 500 people, and will be the seat for the U.S. Army’s substantial R&D budget. They have even hired a Command Innovation Officer, Adam Jay Harrison. A civilian, Harrison is tasked with advising the Futures Command on business models and emerging technology applications, in addition to building networks of warfighters, technologists and entrepreneurs. The bottom line? When you want to make radical change, do the due diligence on your new course – but then throw all your resources behind it. The new Army Futures Command becomes the fourth Army Command (ACOMs), joining the Army Forces Command, the Army Training and Doctrine Command, and the Army Materiel Command. You can explore the new Command here. 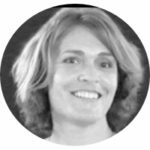 What to learn even more about how to encourage innovation and the benefits of being a groundbreaker? Visit the Stout Innovation Archives right now.